Originally published in 2009, Joe Kelly and Ken Niimura's graphic novel I Kill Giants introduced us to Barbara, an uncompromising teen girl dealing with some pretty big family issues while also saving her community from giants who randomly emerge to destroy her and everyone she loves. Fast forward nearly a decade and now Kelly and NIimura's vision has been turned into a feature film directed by Oscar-winning Danish director Anders Walter, produced by Chris Columbus and starring Madison Wolfe, Zoe Saldana and Imogen Poots. 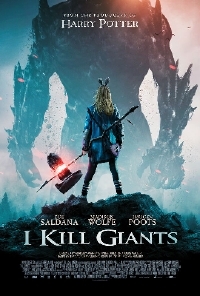 I Kill Giants is a really beautifully imagined story of a girl dealing with some heavy issues by retreating into herself and lashing out at everyone who tries to help her: from her sister, played by Poots, who has put her own life on hold to take care of the family, to Saldana as the school shrink trying every unconventional approach to break through to Sophia (Sydney Wade), the new transfer student who befriends the strange Barbara. Featuring a great performance from Wolfe as Barbara and surrounded by a talented group of supporting actors, this is not only a great story of a teen dealing with a difficult situation but a wonderful story featuring a number of radically different female characters, each with a nuance and depth that's not usually found in treen dramas; even those with fantastic elements. I had a chance to chat with Kelly about the adaptation, and we talked about the process, difficulty and joy of bringing his vision to the screen. 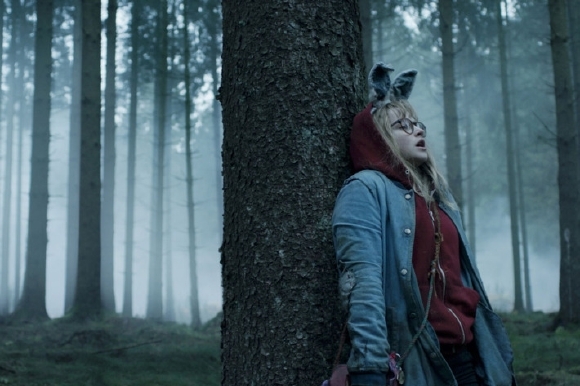 I Kill Giants is available on VOD and Digital HD on March 23. A slightly truncated transcript of our chat is below. Where did the original idea for the story come from? I was a young parent and my daughter, who was precocious and funny, and I was trying to get her into all the nerdy stuff that I like. At the same time, I was going through some stuff in my personal life that made me consider these sort of bigger questions of mortality in a way that I never had before. This is the way they sort of struck me. I sort of wondered what she'd be like if she kind of continued on this path and was this kind of salty, sassy kid with a rich fantasy life looking down the barrel of the same problems and that was the genesis of I Kill Giants. The graphic novel was very well received and won a number of awards. Did you always intend for the story to be a movie or was this something that naturally developed over the years? I always hoped it was going to be a film. I was trained as a screenwriter before I got into comics. I was at the NYU Dramatic Writing program. The instant I wrote it as a comic, I wrote it as a film script because I just loved it. It was also one of those ideas I kind of couldn't get out of my head so I had to re-work it. The screenplay felt like a complete item even though it isn't. At the time it felt like I finished something and I thought it would make a nice spec script. The comic script - it took me a while before I met Ken Niimura who drew the graphic novel. I'd always hoped it would be a film and slowly over the course of time, I met the folks who were able to make that happen and I had a script in my pocket which really helped. 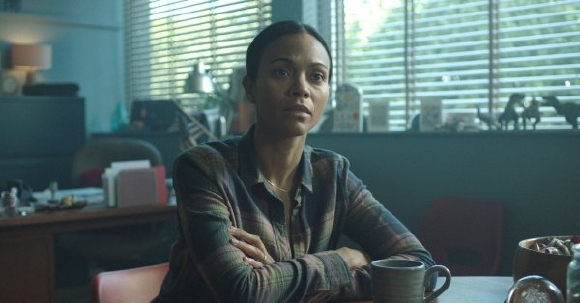 Certainly there are plenty of Hollywood stories about creators kind of disappearing or being gently brushed aside from their own creations and that was never the case with I Kill Giants. From second one everyone understood that it was very close to my heart and that I was the person who was going to be doing the writing. Once Chris Columbus had signed on and agreed to that which was a scary conversation to say the least; that just put a shield around me and everyone just ran with it. It was never a question. It's the opposite of all those horror stories that creators tell and I'm very grateful for that. That script that you had in your back pocket for all those years, how much did you have to brush it up once the movie was a go? It had to go through a lot of changes. It was a very strict adaptation of the comic so it had elements in it, especially once other people came to look at it - Chris gave some notes originally, and then Anders when he came on board - there are elements that you can get away with in a comic book because of your very specific relationship from reader to product. It's a different sensation. Your imagination sort of fills in the blanks. You sort of have a different relationship with a reader than you do with a viewer. So some of the elements in the comic, if put on screen would kind of break the movie in a way where, if you wanted to have any questions on "Is Barbara experiencing something real or is this fantastic?" If you want the audience to have any of those types of questions, those things had to be taken out. That was really the biggest overhaul. And a little bit of kill your darlings stuff had to go on there and I had to have my hand held through some of that process. But it made for a stronger movie. And then we replaced those things with, I think, a little bit more action, a little bit more giant hunting stuff. It still reflects Barbara's inner life and growing tension. Now they [the movie and the graphic novel] kind of exist as great companions to one another. And then of course you budgetary and logistical things that make you have to cut stuff which is always sad but also part of the job. Was there one thing specifically that you fought really hard to keep in the movie because you thought it was really essential and important to the story? One of the first questions everybody asked was about the rabbit ears and almost universally everyone thought we didn't need the ears. And I'm like "The ears are staying. We're keeping the ears." That was something that we sort of fought. Barbara's character - we had a lot of pushback from people who read it and were like "I don't know if I like her." I'd said "Well that's OK." She's a really salty kid. Madison Wolfe who plays her so beautifully in the film, describes her as savage. That armour and the way she carries herself really does become endearing, especially once you see, especially once you see it in Madison's hands. You really do go along with her on this journey. So just fighting to protect her character was really critical. There were a lot of things we let go of. There are one two visuals that I wish we could have kept but like I said before, they would have broken the reality of the movie and it was definitely better to let them go. I'm really glad that you fought to keep the integrity of the character because one of the things I really appreciated is that she's not a cookie-cutter teenager. She's a little bit outside the box which is really cool to see. To see that that is OK and that's it totally fine to be your own person and thought that was really lovely. It's one of the great messages of the movie which I really appreciate. What do you have coming up next? I know you launched a Kickstarter for a short film you you're working on called Poughkeepsie. I'm curious about how that's coming along and if you see yourself adapting any of your other properties into film in the role of the director. Poughkeepsie is actually finished and I've sent the digital stuff out to the supporters and all the backers which is a good feeling. Now I have to get all the physical stuff but we're actually really close on that which is great because people have been really incredibly patient and kind. I never expected it would take longer to finish a half-hour short film than it would to make a feature film. I would love to direct more stuff. I love directing and would love to do more. Meanwhile Anders and I are working on another project together which I'm very excited about. We're working on an adaptation of one of his projects. Ken Niimura and I area also working on another comic book. His style is so beautiful and so suited to a wide variety of storytelling. 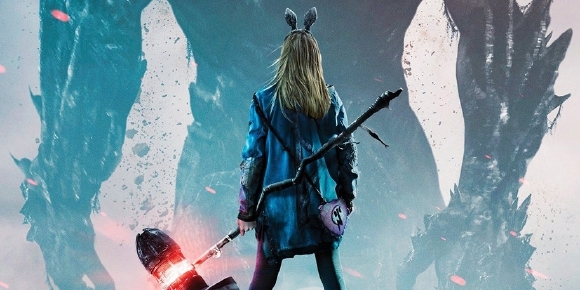 It's a very different kind of universe, more grounded and more of a dramedy than I Kill Giants but it's got its own kind of fantasy element and should be a lot fun. And of course the Man of Action stuff; animation, video games etc. etc. Direct and write more stuff, that's definitely the goal. Never read the graphic novel, but I really enjoyed this movie. The movie poster is a bit of a tease. There are giants, but this isn't an action-driven, special effects extravaganza. It's a a wonderfully done character study of a young girl in crisis.